The AeroFlo system creates stronger, more resilient plants for increased yields. Perfect for flowers, fruits and vegetables up to 3 or 4 feet tall. Legendary growth and yields are hallmarks of this high performance line of systems. A variety of sizes allows for a custom AeroFlo system that fits your needs The AeroFlo super-oxygenates the nutrient solution to optimally deliver oxygen, water, and nutrients to your plant’s roots. This system creates stronger, more resilient plants for increased yields. Perfect for flowers, fruits and vegetables up to 3 or 4 feet tall. Bring your plants to harvest earlier and maximize the productivity of your grow space with the AeroFlo. With four different models to choose from, there is an AeroFlo unit for every requirement. Find a store near you that carries AeroFlo. The AeroFlo 36 system offers 36 plant sites in a footprint designed specifically for indoor cultivation under a grow light. Grow flowers, fruits and vegetables, up to four feet tall. The AeroFlow 36 is matched with a generous 40 gallon Panda reservoir. 5’1”L X 6’10”W X 2”H footprint or 5’1” X 11’7”W X 2’H in a staggered configuration. The AeroFlo 60, features sixty plant sites and a generously sized 40 gallon Panda reservoir. Growers have two configuration options: all the grow chambers to one side for a smaller footprint or staggered from side to side to accommodate larger plants. The AeroFlo² 60 features a 40 gallon Panda reservoir. Use the Extension kit to increase to 120 sites and 80 gallons. Our largest unit is the AeroFlo 60 combined with an Extension. 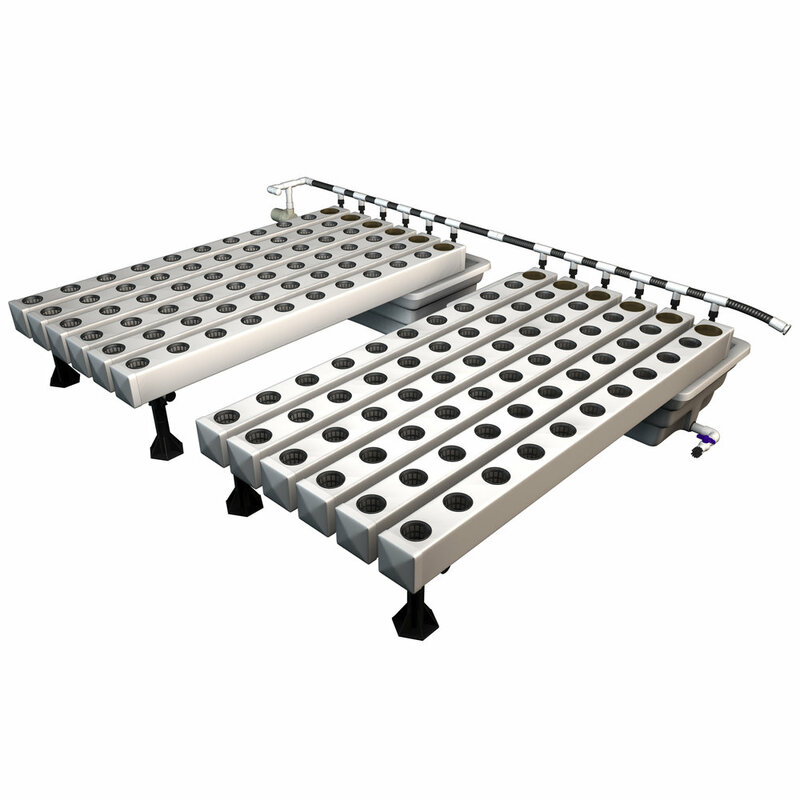 The AeroFlo 60 Extension doubles the grow sites to 120 and the reservoir capacity to 80 gallons. Configure the grow chambers all on the same side or to stagger them to accommodate larger plants.